We sell the best for less!! Welcome to our store. We invite you to browse through our store and shop with confidence. In addition to selling fireworks we also do professional displays for wedding, parties and special events. We hope you enjoy your stay at our store and hope you visit often, please let us know if we can help with any of your pyro needs. Looking for a gift that is unique Half off fireworks gift certificates. Shells you put in a tube and light. 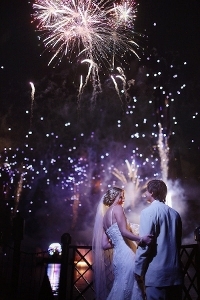 1 Minunte wedding exit show , includes fireworks, license, permit, clean up and a lot of fun! Full 3 min wedding show that includes license, permit, all the fireworks and clean up. Silver swirling tails with red dahlias and white strobe breaks. Silver tiger tail comets to white strobe. Powerful finale with timed rain mine and bursts with emerald and ruby dahlias. Tell the world you are having a Boy or Girl with fireworks!! We take care of everything set up to clean up. Copyright © 2001-2019 Half Off Fireworks LLC. All rights reserved.